That said, a well-meaning customer gave us a good old fashioned scolding the other day. And the customer is always right. As far as build out goes, we have floor drains and a cold box. For the latter we are using a 24.5k BTU window AC with a Cold-Bot. The cold box is 8×15′, so this AC has no problem maintaining a perfect 38F. It will hold even better once we get several batches of cold beer in there as well! On the tasting room side, we are working with Shawn Benson from SideYard, and Tyler Cristobal, our in-house designer. We have met several times refining the plans every step along the way. I would say the design is 80% there. We are still tossing ideas around how the taps themselves will be installed. We’re aiming for 18 taps. I am so stoked to be working with these guys, and I know they will help make our tasting room comfy, interesting, and simple. 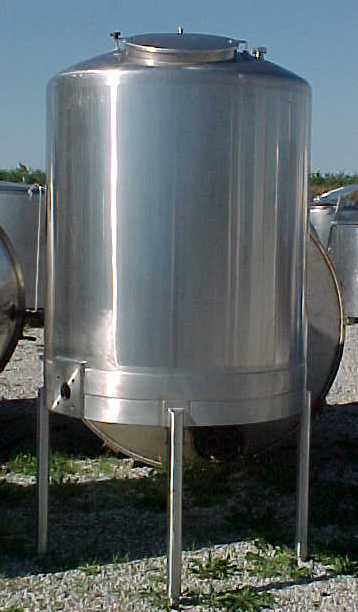 We have at least (1) 7bbl Uni Fermenter from Premiere Stainless waiting for us, and we hope to order 2+ more in the coming month. En route we have a 300 Gallon dairy tank (it looks like a can of soup cut in half), and a 450 Gallon boil kettle (also an old piece of dairy equipment). Our 200k BTU Tankless Hot Water Heater has already arrived for the HLT. Here’s our 450 Gal Kettle. 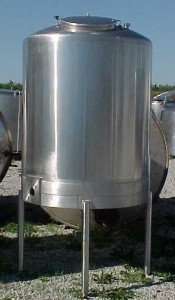 We also have (4) 3 bbl Brite tanks set to arrive late June. This half capacity will force us to split the batch at the serving vessel. So we’ll be looking for a hop back soon. We still need to order: sanitary pump, power pack (glycol for tanks), plate chiller, really expensive tubing/fittings, and a few odds and ends. Timeline? Who knows? We won’t put a beer on tap just because we’re excited that we brewed so much. So we’re not interested in making a time commitment, although deadlines are good. That said, I hope to brew our first water batch by late June, and our first wort batch shortly after. Whether or not that goes on tap or down the drain will be determined, and if we have to dump 3 batches, then so be it. That’s our attitude for now. We have all of our homebrew supplies, packaging station, “office” and more where our brewery will be soon. I hope to fit (5) 7 bbl fermenters in there by the end of the year. It’s going to be a challenge for us logistically with our tight space, and with so many things going on, but we have one of the best group of people in the whole freaking world to help us figure it out. And better yet, we have some of the coolest, most talented, and intelligent customers in the whole world, so I am sure you will all have some helpful tips down the road. For now, this is the plan and we’re sticking to it. There are probably a million articles on this out there, but how about one more? It is true that typically Crystal malts were made in Europe, and Caramel Malts in the US. This seems to be the only difference. According to a Briess article on the topic, that is the main difference. Most people are using the term interchangeably. The malt producers at least stick to the distinctions, but no one else seems to care. Not sure if we do either. Indeed, one of our main distributers has us order “Briess Crystal 10L,” but when the bag arrives it says “Caramel 10L.” We have crystal/cara/caramel malts from 6 different maltsters from around the world, so we enjoy tasting all of the options and making the decision based on our goals. Most Crystal/Caramel malts are made by stewing grains at temperatures that achieve saccharification, and then roasting them at temperatures above 300F to produce a hard crack type caramel, or “crystallization” of the endosperm. There are some caramel malts that are produced using a kiln, but the maximum temperatures possible with a kiln are about half of what a roaster can do, so this requires more time, and is generally less consistent than roasting. The only for sure way to tell, is to visit the websites for each major malster, and read up on what processes/techniques they use. Briess is probably the most helpful here. We’ll attach links to the malt companies that we use most, and furnishing a more detailed report would be a good project for the future. Briess, Crisp, Bairds, Weyermann, Castle, Thomas Fawcett, Gambrinus, Great Western Malts, Franco-Belges. We were promised a wine extract kit from one of our main distributors. They were bragging about the quality you can get with very little practice. We asked for a Malbec and received it the following week. 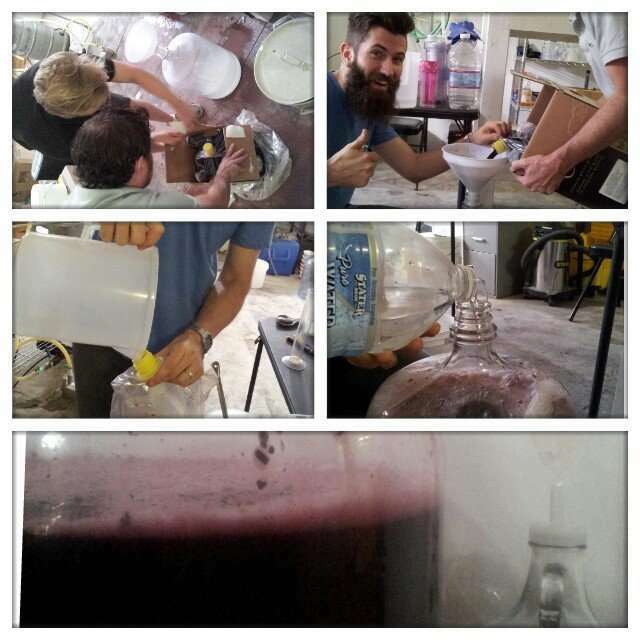 This was so easy, we managed to produce 5 gallons of wine in between our 45 minute and 10 minute hop additions, and this was with us reading the instructions 3 times over. Future wines will be even quicker. Easiest double brew day ever. The jury is still out on the taste, but here’s the low down on the day of. Accompanied by one of George’s new favorite things: a collage (he still needs practice). 1. Clean sanitize fermenter and a funnel. 2. Dissolve bentonite (a clarifier) in quart of warm water and add to fermenter. 3. Add wine extract. The less concentrated the extract, the more expensive the kit. 4. Rinse the emptied extract bag w warm water and add to fermenter. 5. Top off w water to 5 gal mark, stir vigorously, add yeast. 14 days later we added some more clarifiers and racked to secondary. Fred Brophy of a href=”http://Www.mashheads.com”Mash Heads/a recommends racking several times. We’ll probably do one more in a week, and bottle by day 45. We’ll test it on Molly once it’s ready. And will post our thoughts. We’re thinking temp control on the next fermentation. German Ale, British Ale, Whitbread, Ringwood, Northwest, Kolsch, Belgian Abbey Ale II, Forbidden Fruit, French Saison, Belgian Saison, Roeselare Blend, and Trappist High Gravity. You’ll find them in the yeast fridge sharing two blue containers. Click here for more info about each individual strain. Today we received our packet from the ABC. Included is a checklist of forms to complete, and a nifty sign to post in our window. Essentially we are now in the protest phase of our application. The sign in our window will remain for 30 days, and we are required to send out notifications to nearby residences. The community has 30 days to make any protests. At that point it is up to us to negotiate/explain/placate any and all concerns. It’s an important process designed to empower the community. So are we so nervous? Well, there is small, and vocal, portion of our community that opposes absolutely every application, forcing applicants to spend money on rent, lawyers, and delayed start dates. We can’t afford much of this. The SD Police Department is also vocal in this process. As they should be. They are the ones that we all rely on to keep our streets & sidewalks safe, and they are grossly underfunded and overworked. They are likely to impose as many restrictions as they can. We will be reaching out to them in the coming days so that we can begin the dialogue. For now, we will post below a copy of the letter to our neighbors that we have posted next to our sign. It will answer some basic questions about our goals/vision. We are excited to announce our plans to begin brewing on the small scale. Our plans for our brewery are a little different than most, so we hope you will take the time to read the Q&A below in order to learn more. Most of all, we are honored to have this opportunity to play a long lasting, sustainable, and positive role in the growth of our beautiful neighborhood. We invite you to come in and chat with us about our plans. 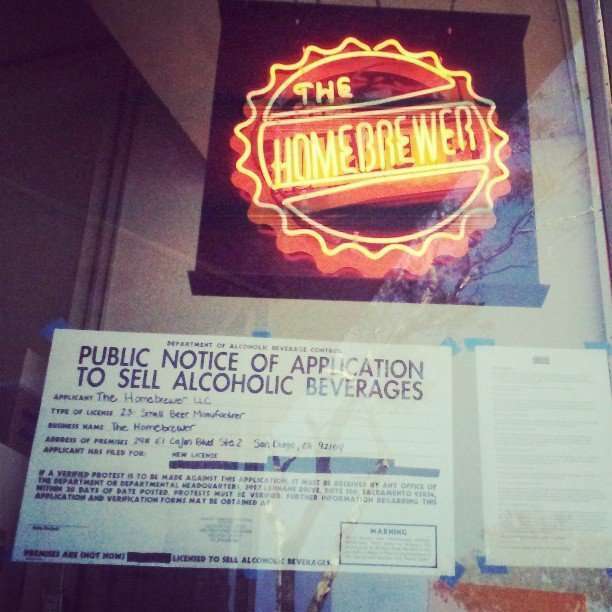 You can also email us at brew@thehomebrewersd.com. Q: What is The Homebrewer? A: We are a resource center for homebrewers. We provide the equipment, ingredients, and knowledge for those interested in making their own beer at home. Our emphasis is on educating the community about how to make quality, great tasting beer, and how to appreciate the rich history and many styles of beer with respect and responsibility. Q: Do you intend to become a bar? A: Absolutely not. Our favorite bars are nearby, and within walking distance of our shop, you should go check them out. We will not serve the quantities or have the operating hours of a bar. Q: So then why do you need this license? A: This license will allow us to brew examples of certain styles, showcase specific ingredients, and demonstrate different brewing techniques. This will better enable us to inform/educate all of our customers and the community at large. We hold regular classes about how to brew beer at home, and this will allow us to serve you all better in this regard. Q: What will the atmosphere be like? A: Our beer showcase room will feel more like a small winery than a bar/”tasting room.” Our staff will be trained to discuss the different aspects/qualities or beer making, and our goal is to educate and inform the average consumer and the homebrewer of every skill level. Q: What kind of beer will you produce? A: We would like to create beers that you can enjoy with your favorite family dinner. This means low to moderate alcohol levels, and flavors that are ideal for food pairing. Q: What is your ideal customer/transaction? A: We hope you will come in, try a few examples of different beer styles/brewing techniques. Ask our knowledgeable staff about how those beers were created, what foods they will pair with, and which beers like it you should look out for at nearby establishments. If one of our beers is ideal for your next meal, we hope that you will take a refillable bottle of it home to share with your friends and family. Q: Are you willing to listen to any concerns? A: Certainly. Our neighborhood and it’s future is an ongoing community effort that requires the input and consideration of every one of us. We all of have valid points about what our neighborhood should look like in the future, and it is all of our responsibilities to take the time to share our views and listen to the views of others. We want our business to play a positive, long-lasting role in our neighborhood, and we want every individual to feel empowered about the direction we are all taking. We only ask that you keep an open mind to our dreams, vision, ideals, and opinions about how to create sustainable, walk-able, friendly, and economically viable neighborhoods. Jeff from Mash Heads, a homebrew club in San Diego proposed an experiment in which we dry hopped bottles of beer with different varieties. We had a keg of Mission Brewing light lager to work with, an ideal base for our experiment. We filled 15 22 oz bottles using a ratio of 1/2 oz per gallon, many higher gravity IPAs use 1 oz per gallon. Jamie and Tricia from Mash Heads were kind enough to host the tasting at their house. There were about 12 Mash Heads present. For info about the hops we used, and some tasting notes check out Jamies blog at The Cask & Barrel.